At the center of the Centaurus galaxy cluster, there is a large elliptical galaxy called NGC 4696. 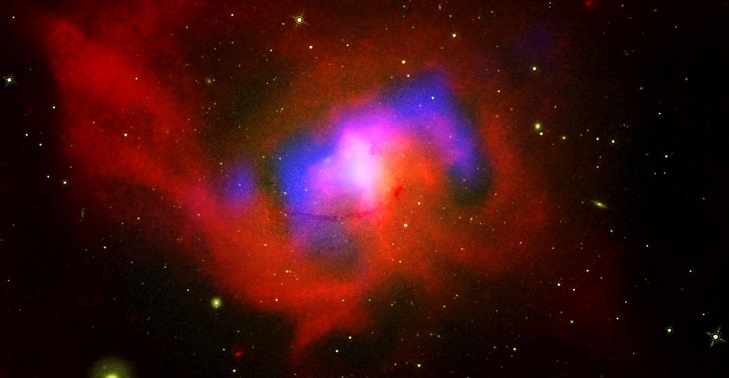 Deeper still, there is a supermassive black hole buried within the core of this galaxy. New data from NASA’s Chandra X-ray Observatory and other telescopes has revealed details about this giant black hole, located some 145 million light years from Earth. Although the black hole itself is undetected, astronomers are learning about the impact it has on the galaxy it inhabits and the larger cluster around it.